“In the Midst” is an audio autobiography of Barbara Beach Alter. Alter and her husband James served the American Presbyterian Church as missionaries. They spent 35 years in Northern India and never converted anyone – on purpose. When the mission board commissioned Alter, its members charged her to “live in the midst” of the people, wherever she was stationed. Her job was to be of service to those around her, rather than to proselytize or evangelize. The series of short audio pieces that make up this project explore Alter’s understanding of herself as a Christian committed to social justice. She explains the influences on her decisions to practice an ecumenical form of liberal Protestantism, from early childhood through retirement. She counts among these influences her family, Connecticut College, the New England Student Christian Movement, and the works of American theologians Paul Tillich, Reinhold Niebuhr, and Walter Rauschenbusch. 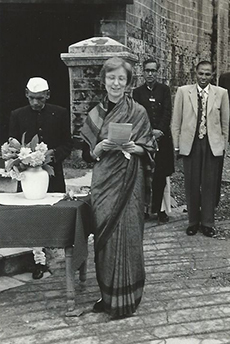 Her theology evolved by interacting with and reading the books of Indian nationalist Mahatma Gandhi and the French Benedictine priest Abhishiktananda. Alter and many other missionaries of her generation served as foreign missionaries interested in pacifism, ecumenism, and cultural pluralism. Their influence reaches from their work in a variety of international settings to their own children and grandchildren, many of whom have chosen to continue working in the midst of poverty and injustice to enact positive social change. They want their stories heard at a moment when they believe fundamentalist evangelicals dominate the history of Christianity around the world. This series of stories serves as a memorial to the life, work, and spirit of one woman. It is intended also to serve as a memorial to the beliefs and energies of a generation whose actions are overlooked, if not forgotten.